What does the future hold for a child born in Melbourne today? What is VCAT thinking ? What they dont tell you however that a permit cannot be granted for a protest sign...as its not in their list of permittables!!. CREMORNE/RICHMOND - Tell them what we want ! THE RESIDENTS OF CREMORNE/RICHMOND HAVE PUT UP THEIR OWN PROPOSAL ABOUT HOW TO DENSIFY THE AREA WITHOUT MASSIVE SKYSCRAPERS THAT NO ONE EXCEPT DEVELOPERS WANT. Perhaps it is time to take things into our own hands and tell the government what we want, not only what we don't want. What is the Planning Department trying to do to the people of Victoria? The Question must be asked. What is the Planning Department trying to do to the people of Victoria? Do they want to swamp them with so many Reviews and Committees and Consultations and requests for submissions that the people will drown under the pressure of it. Well those people who are in a position to even know about it. Most people have no idea what is happening until it is decided by these unknown committees who represent nobody. People already have no confidence in consultations a la Windsor Hotel, now it will be even less. St Kilda Triangle. They Won ! You Can Too ! THIS IS FROM SERGE OF THE ST KILDA TRIANGLE WAR - THE MOVIE WILL BE A MUST SEE. We have to be firm, pure and faithful. At the end of our struggle, there will be the biggest glory in the world, the glory of men (and women!) who have not surrendered. Jenny Warfe of Blue Wedges Coalition names the Elephant in the Room – population growth that is our worst enemy. Prof Troy vs Prof Newman - High density debate ! This goes back to 2006 but is still relevant and worth reading. Victorian Planning System Ministerial Advisory Committee. The current respective roles of state and local government in planning are not appropriate and I attach a submission on behalf of the members of the Boroondara Residents’ Action Group for consideration. I hope this is not just another ‘ticking the box’ exercise and submissions from the public and community groups will be giver proper weight in the committees’ considerations. I say this because previous submissions on this issue have certainly not been seriously considered. Joel Kotkin,US Urbanist says it right and spells it out to Committee for Melbourne CEO . Suburbs better than densification so decentralize instead of going up. I don't usually recommend U-tube videos, but this one is just so good at making Heinberg's point about the impossibility, and indeed folly, of our politicians' pursuing indefinite economic growth. acclaimed new book, "The End of Growth: Adapting to Our New Economic Reality." WHAT DO YOU THINK OF THIS? More freeway on the Peninsula. My fear is that the whole Peninsula could end up a giant developers dream and be suburbia from end to end. Maybe you like the idea. Or wouldn’t it be better to use the money to improve public transport.? Our cities are being poorly planned and overcrowded and now we are not even sure about food supplies. What is wrong with our government in Canberra? FINALLY a major election promise has been kept. Planning Minister Matthew Guy has told Knox Council it can decide heights of developments in the Boronia activity centre. We want to see more of this. We are tired of being told we have to cram in thousands more people and put up with high-rise buildings in our comfortable residential areas. 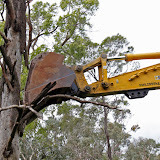 The Planning Department and the Victorian Civil and Administrative Tribunal need to accept this. All councils should use this ruling as a precedent for their own activity centres. After all, 7.5 metres, which is being used in Boronia, is scarcely more than two storeys high. That would suit us in our area very well. Thank you, minister. The why are we wrecking our lifestyle by overcrowding our cities? The government has got it wrong. Time to tell them, before we are overdeveloped out of existance. More dense population = more danger from natural events. How dense are you ? Being an avid viewer of History Channel on Foxtel, tonight watched a program on earthquakes. It was making a huge deal that the major earthquakes of the early 1900's and the more recent earthquakes since last Christmas (Japan tsunami, Christchurch, Chile volcano* and last year Haiti), that a HUGE factor is that the earth population has nearly doubled since 1960. Not only does the planet need to feed, cloth and find shelter for the population but as we occupy more land some of the higher population densities mean more people in less space and if there was an earthquake, WHAMO - fatalities on an unimaginable scale. This almost makes climate change minor. The old known fault lines are moving and previously safe areas are now suspect. So new major population areas can fall prey to earthquakes. FINALLY someone in the state Labor opposition has faced up to why it lost the election (''Melbourne growth got away from us'', The Age, 18/3). The rapid population growth that, as premier, John Brumby promoted and revelled in brought him down. He mistakenly thought that by packing people in around public transport corridors and pushing Melbourne ever further outwards without putting in more infrastructure, he could go on forever overcrowding us. He was wrong. If you increase the population you have to also increase the infrastructure by the same amount otherwise you end up with overcrowded roads and trains and schools and hospitals and pressure on electricity and water and sewerage. Did you see this win against council bad planning - and here below is a letter about another very wrong council decision which could have disastrous implications for our coastline- This is an amazing Supreme Court precedent and councils must beware. AN ARTICLE by Bob Birrell about the increasting cost of housing on the fringes of Melbourne. The base problem of course is the number of people coming here and until the government take measures to slow it down it will continue to get worse. For a start they should scrap the Live in Victoria website and also tell the Feds to reduce Victoria's intake, these measures to reverse what Brumby activated in his desire to make Melbourne bigger than Sydney. Prof Michael Buxton - RMIT - talk on poor development in Victoria from Marvellous Melbourne on Vimeo. Talks on poor development in Victoria at Protector of Public Lands AGM. 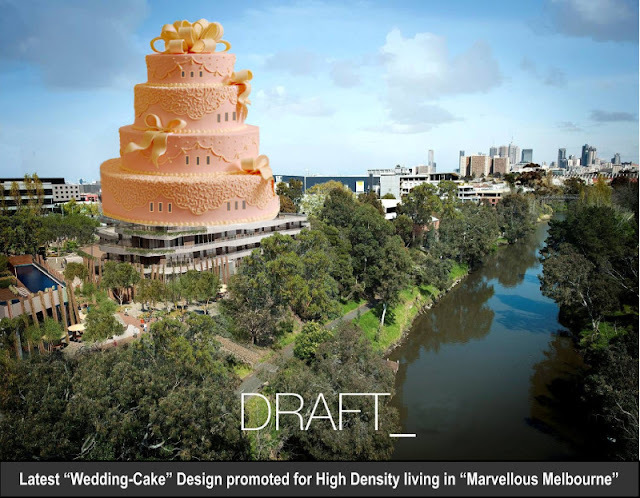 This is what the Planning Institute think is the easiest idea to get approved - the Wedding Cake design for apartments. CONGRATULATIONS GILLIAN AND ALL YOUR SUPPORTERS AND ALL WHO GAVE A HAND THROUGH THE MONTHS OF COLD WINTER ON THAT PICKET LINE IN FRANKSTON TO SAVE THE HISTORIC PROPERTY WESTERFIELD FROM DESTRUCTION BY A ROAD THE GOVERNMENT WANTED TO PUSH THROUGH IT. You see you can make the Government back down when it is 2 months before an election. I have to ask why did Minister Pallas let them stand out there through the winter and only finally now has backed down???? Cynically I say because he thought they would give in, so he waited and waited and they beat him. Good lesson to us all. I have just received a call from Gareth Stephenson of the CFMEU. Minister Pallas has the evening agreed to suspend work on the Westerfield property until our appeal to VCAT has been decided. He has also agreed to work with community representatives to find agreeable solutions to the environmental concerns we have been upholding. Supreme Court supported VCAT that Minister Madden and Heritage Victoria were right in condemning the Windsor Hotel to being half destroyed to allow the Indonesian owners to build a massive glass tower above it. Our Heritage being sacrificed so that Developers can make a fortune. Both Minister Madden and his lame Heritage Victoria have a lot to answer for. You will have your chance to make them answer in the coming November elections. It is time for a change.